Radon can't be seen, tasted, or smelled. If you haven't tested for it, there is no way of knowing whether it exists in highly carcinogenic levels within your home. Studies have estimated that the annual number for radon-related deaths in the United States is in the tens of thousands. The Surgeon General has issued a warning that radon is the second leading cause of lung cancer in the US, second only to tobacco smoke. If you live in a smoking household with high radon levels, the risk level is much, much higher. 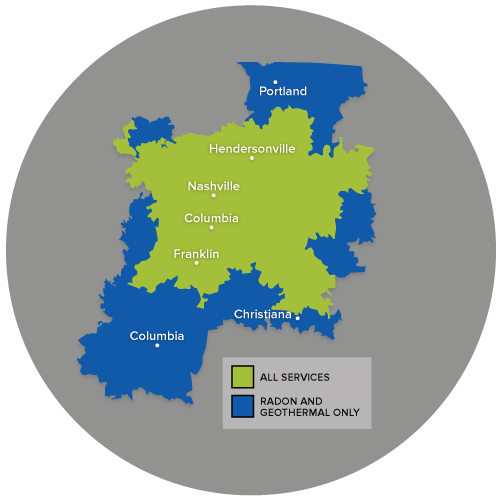 We offer our radon services in Nashville, Franklin, Murfreesboro and surrounding areas. Call us today to schedule a free consultation! Radon is found naturally all over the world, including the U.S. It comes from the radioactive breakdown of uranium that's present in the soil, rock, water, gas, and building materials. Human beings most commonly come in contact with it in the air and, to a lesser extent, in drinking water. It can be present in buildings of all types, particularly in residential buildings. We Can Help You Control Radon In Your Home! Precision Air can test for radon gas levels in your home! If it's discovered that the radon levels are above the recommended levels, our specialists can work with you to customize a radon mitigation system that will effectively address your issue. Don't wait to make your home a healthier, safer place to live! Call 1-844-386-0719 or contact us online today to schedule a radon test or receive a free radon mitigation system quote!